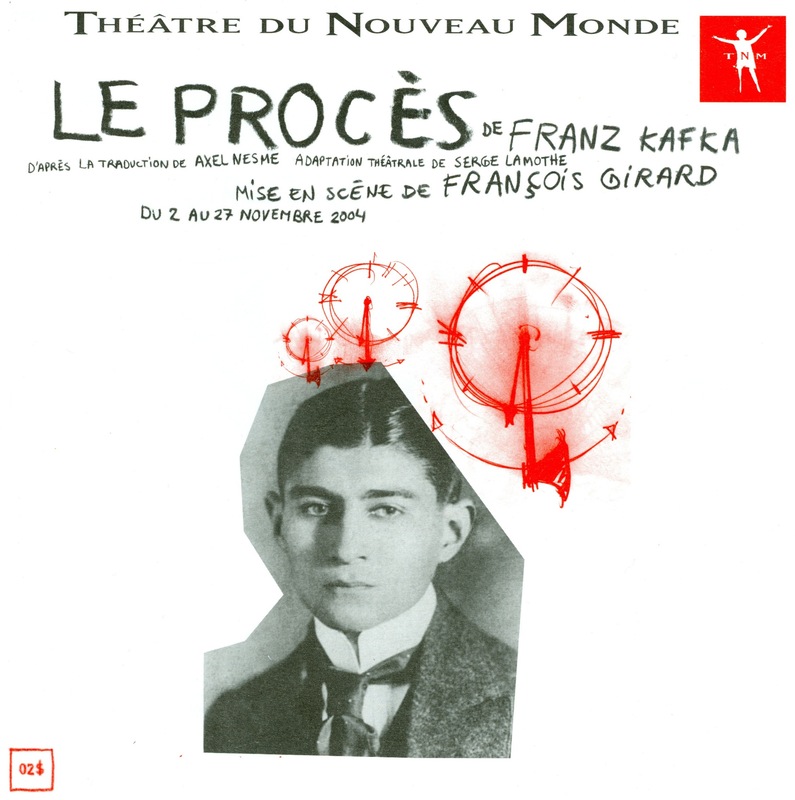 The sound compositions for LE PROCÈS were based on recordings of the cast voices and on recordings of the props and set. This audio excerpt is a montage of different compositions heard by the public during the set changes, which were complex and involved many props. During those changes, the main character performed in front of the dropped curtain. His actions were choreographed, without dialogue. The compositions accompanied his gestures and served as a means to introduce the atmosphere of the next scene. 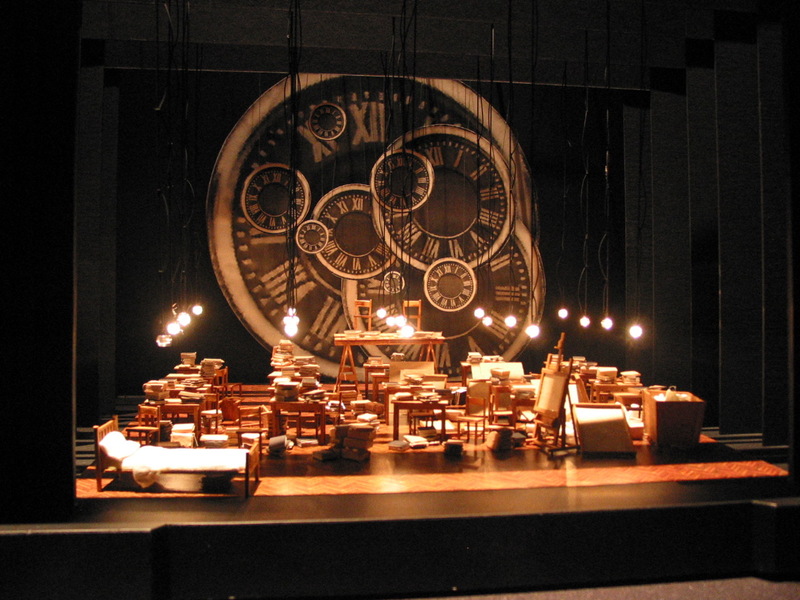 The following text was written after the shows were initially presented at Montreal’s Théâtre du Nouveau Monde (TNM), before it was to be performed at the National Arts Center of Ottawa (NAC). At the time, my concern was to clearly communicate the show’s design concepts and required equipment to the NACs’ sound department and production directors. A choir of eight actors is present on stage at all times. Their vocal interventions are strictly acoustic (not amplified), except for the very beginning of the show. LE PROCÈS is divided in ten chapters. Each is preceded by a set change occurring behind the dropped curtain. As Joseph K, Alexis Martin remains in front of the audience during these changes. Their length varies from 50 to 80 seconds, during which time Joseph K does not speak. Sound montages are broadcasted. A different curtain composition is associated with each set change. Curtain composition #1 is associated with the set change following chapter 1, curtain composition #2 is associated with the second set change, etc. Each composition’s start cue is in “snap mode”, without fade-ins or fade-outs. The stage manager gives the cue. They last between 50 and 80 seconds. The compositions are mainly broadcasted through the front of house (FOH) sound system. At the TNM, with the help of Soundscape (their broadcasting software), we created quite complex broadcasts in the theater’s surround system and on stage. Some parts were only broadcasted in the surround, others only on stage. At the NAC, it will probably be easier to broadcast a stereo mix. I will later describe how the sound could be optimized at the NAC. Discussions with Denis Redmond, sound operator at the NAC, will be necessary. Each chapter is associated with a sound clock montage. There are thus ten distinct clock montages, lasting between 8 and 25 minutes. During each chapter, the actors’ voices are accompanied by rhythms of squeaking sounds as if emanating from the set’s clock mechanisms. The clock montage associated with a given chapter is heard as soon as the curtain rises. The clock stops as soon as the curtain drops. All the clock montages start and stop at the curtain’s rise and drop, in snap mode. These montages are broadcasted in the upstage system. 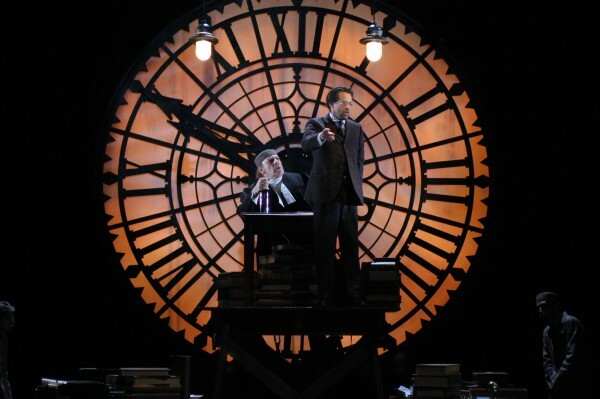 A twelve-foot wide clock – a crucial element of the décor – is suspended at the far back of the stage. The clock’s hands move. The montages are made to sound as if they really emanate from the clock. Montages for chapters 1 to 5 are on Disk A. Montages for chapters 6 to 10 are on Disk B. There are two wind atmospheres. A background wind atmosphere supports the text during the entire performance. A second atmosphere is specific to each chapter: ten different atmospheres accompany the ten chapters, whose durations vary between 8 and 25 minutes. The background wind atmosphere starts when the public enters the theatre and ends with the applauses at the closing of the show. The specific chapter atmospheres begin in a slow, almost imperceptible fade-in at the curtain’s rise, and end in a rapid fade-out at the curtains’ drop. All the wind sounds (both background and chapter-specific) are broadcasted in the surround, at a very low intensity. The wind atmospheres must never infringe on the actors’ voices. They must resonate in the whole theater, and not emanate from a particular speaker. The background winds are broadcasted with a DAT player. At the TNM, the chapter-specific winds are broadcasted with a 360-system Digicart player. At the NAC, they will be broadcasted with a mini disk player. Fade-ins and levels are programmed directly in the Digicart player. If we make digital AES/EBU copies from the Digicart to the mini disk player, the pre-programmed fade-ins and levels will remain identical. The theater is going dark—–> Élaine Normandeau (stage manager) calls the cue to the sound operator to start the first montage. 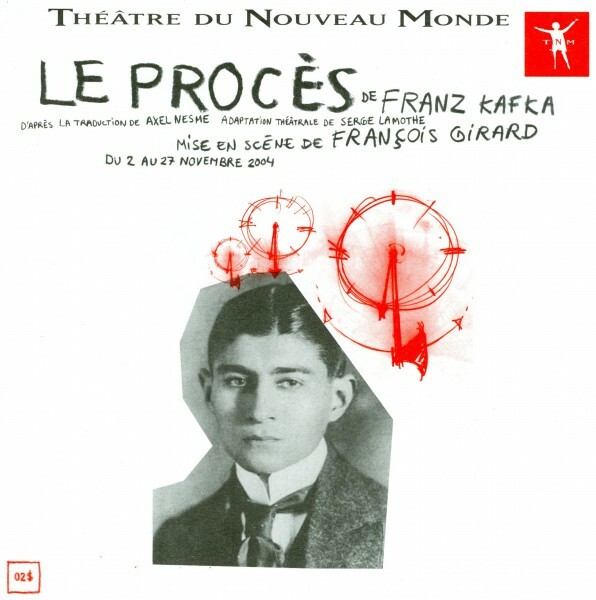 It is a recording of the choir reading the first pages of Le Procès. While this material is played back, we must crossfade between the recording and the choir’s live reading voices. The aim is to hide the transition from the recorded voices to the live voices, as if we zoomed in on the live voices. During chapter 4, a torturer uses an electric machine to torture his victims. Two microphones (Countryman Isomax IIc) are installed directly on the machine to amplify the machine’s real sounds. These gunshots are lightly amplified. At the TNM, we used 2x Crown PCC 160 located at the center on the edge of the stage. Behind the scrim, upstage, near the clock, two speakers are installed, one at stage right, the other at stage left, both 8’ 6” from the centre. The speakers’ bottoms are at 12’ from the floor of the stage; the horizontal dispersion must be 45 degrees maximum . At the NAC, a pair of EAW KF300 will be positioned in the same way, but hung horizontally rather than vertically. 2- FOH system: The front of house system is delayed on the upstage system. 3- Surround system: The surround system must amplify the sounds so that the audience perceives them as immersive. I will give Élaine the new cues she will have to signal to Denis Redmond during the show. Denis, in the sound booth, will hear them on his headset. He will get most of his cues from Élaine. For all the cues, the FOH is delayed with regard to the upstage system. All the curtain compositions’ broadcasts share the same distribution – sub, FOH, upstage, surround. Once the distribution of the first montage is determined, it is the same for the others. Approximately: FOH 55%, upstage 40%, sub 100%, surround 5%. The same goes for the wind sounds distribution. Once the distribution of the first background wind is found, it is identical for the others. Approximately: FOH 40%, sub 100%, surround 60%.